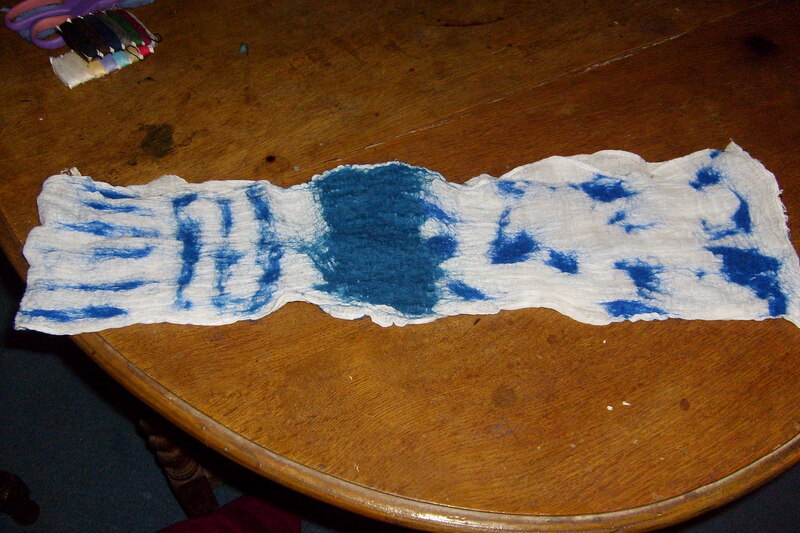 So ages ago now I attempted a nuno scarf. I had read up briefly on it but just wanted to fling myself into it…definitely a learning curve! This picture was my first ever attempt. I layed wool on both sides of muslin fabric, but I reckon 1 much thinner layer would have worked better, as this one doesn’t drape fantastically well. 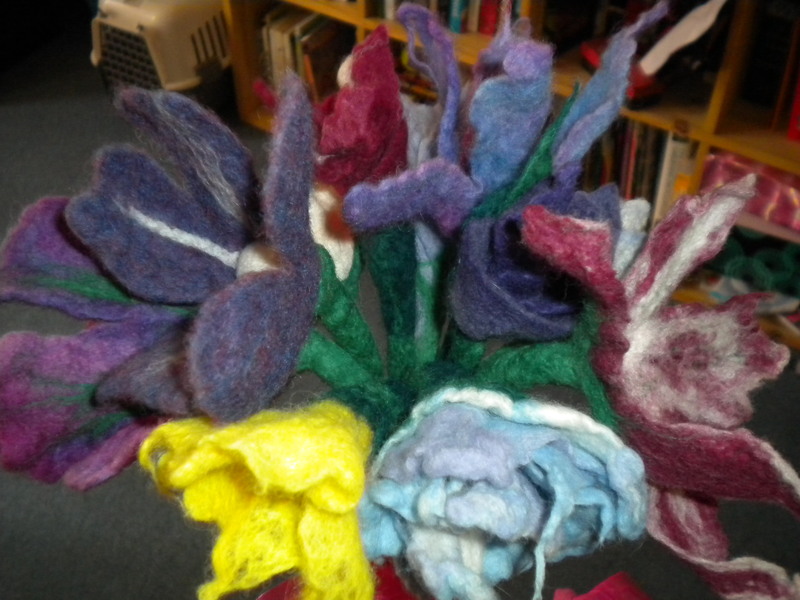 I loved experimenting with different shapes, thicknesses and directions of laying the fibres. Doing the seperate ‘sections’ really gave me a good insight into how merino acts when nuno felted onto cotton muslin. 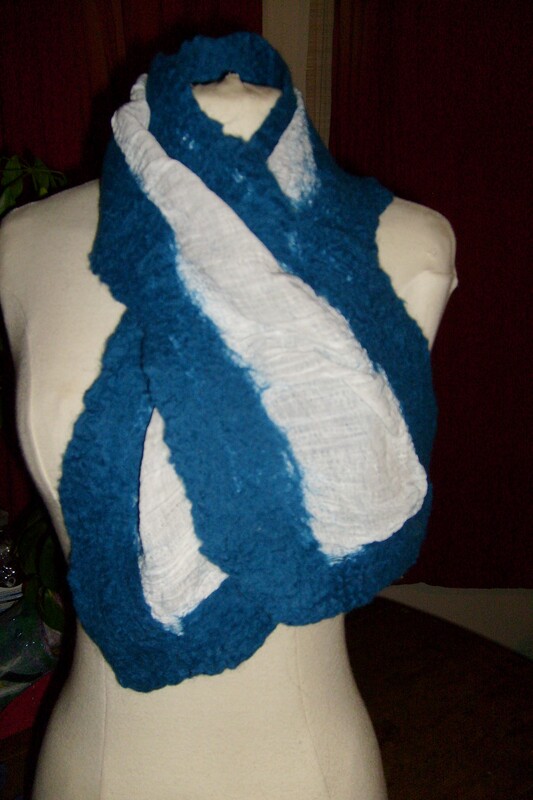 It’s also a scarf that I’ve actually worn and enjoyed wearing. My first attempt is far too stiff so will await its future reincarnation into another experiment! I haven’t posted for a while, but I have done some playing. 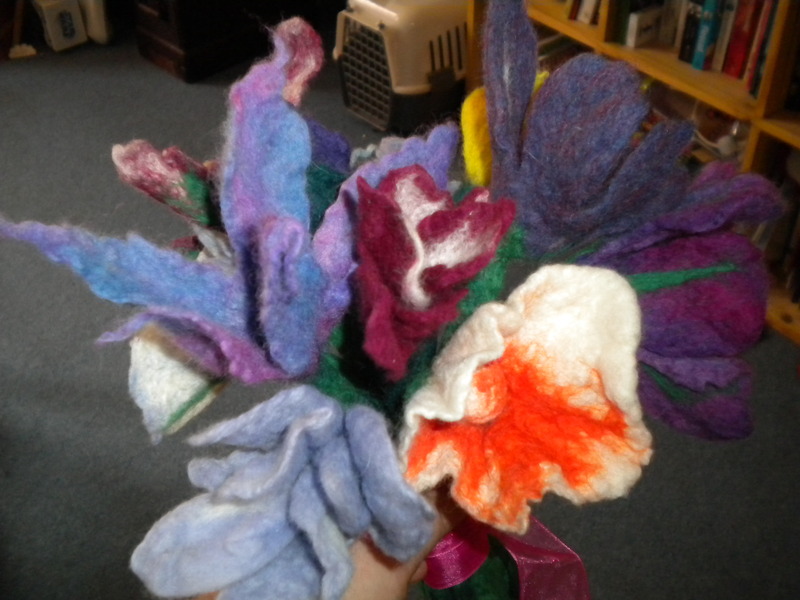 I did a couple of experimental pieces – one using silk cocoons and using wensleydale differently and one where I trapped small squares of fabric, yarn, beads and feathers (the feathers didn’t work at all!). But they are for a different post really as I haven’t photographed them yet. 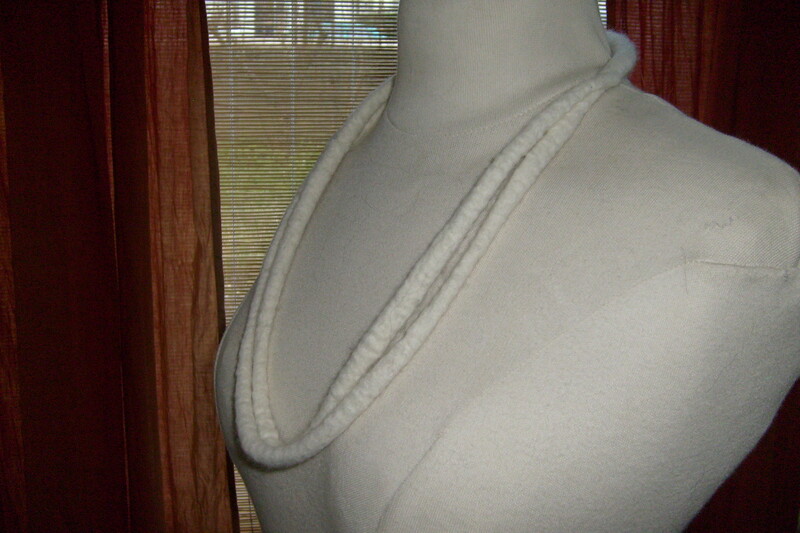 The first rope I made was too small to fit over my head if I made it continuous, so I left it as a single length. Then I made a continuous rope that was big enough. 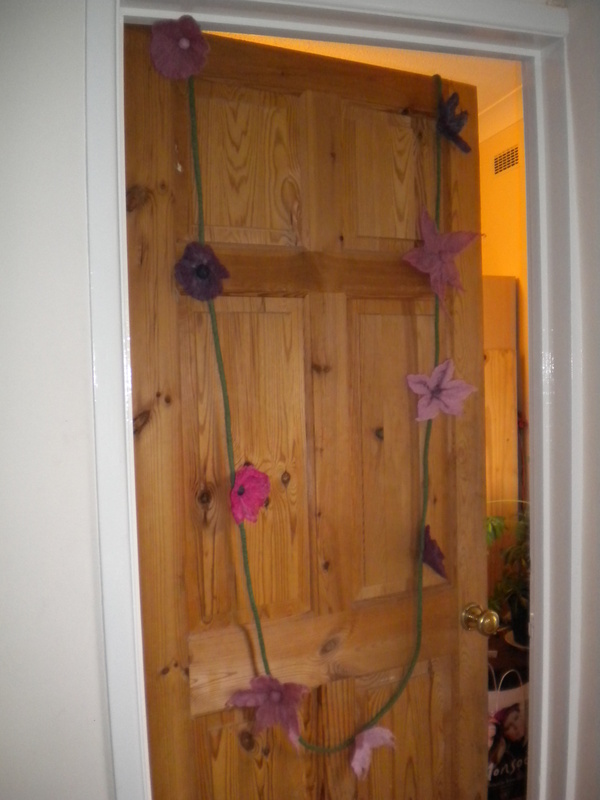 It looked a bit plain and I wanted to make use of my earlier mistake so I felted it onto the second rope. The effect this gave was lovely I think – 1/3 of it is 1 stranded and 2/3 is 2 stranded. It’s something I might not have thought of if I hadn’t made the error. Felt, how I love you! 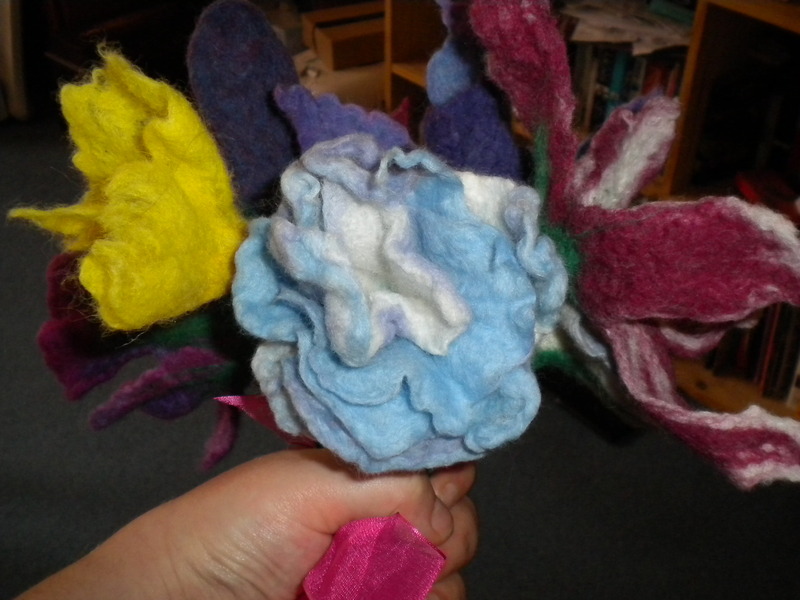 Then I made some individual layers for my flower. I think the wool was corriedale. 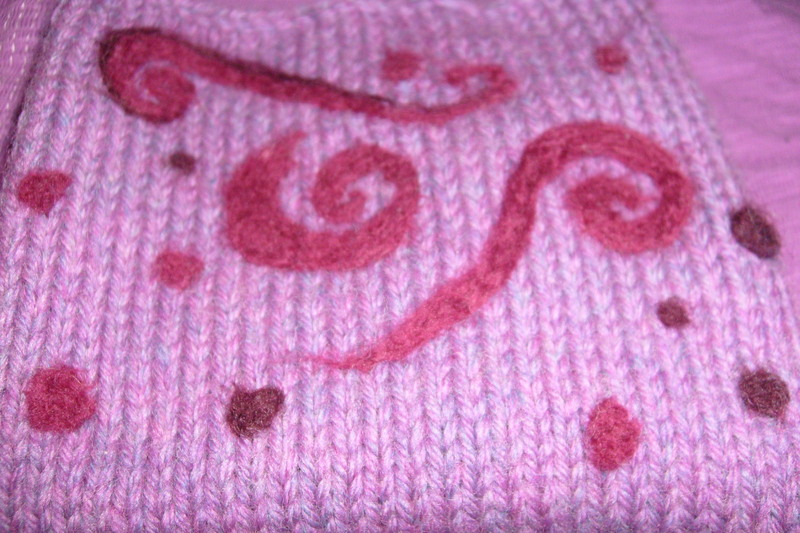 I got them to pre-felt stage but they looked a bit boring so I added some whisps of white merino to about half of them. Towards the end of the process I started trying to give them a bit of shape. 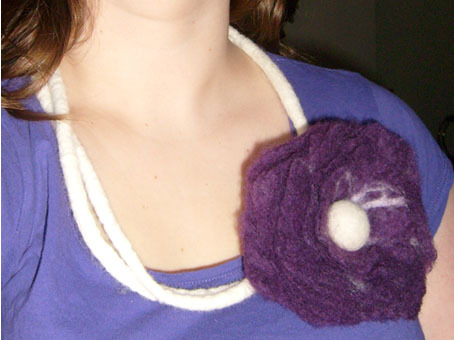 I also made a merino ball to use in the center to tie in with the colour of the necklace. 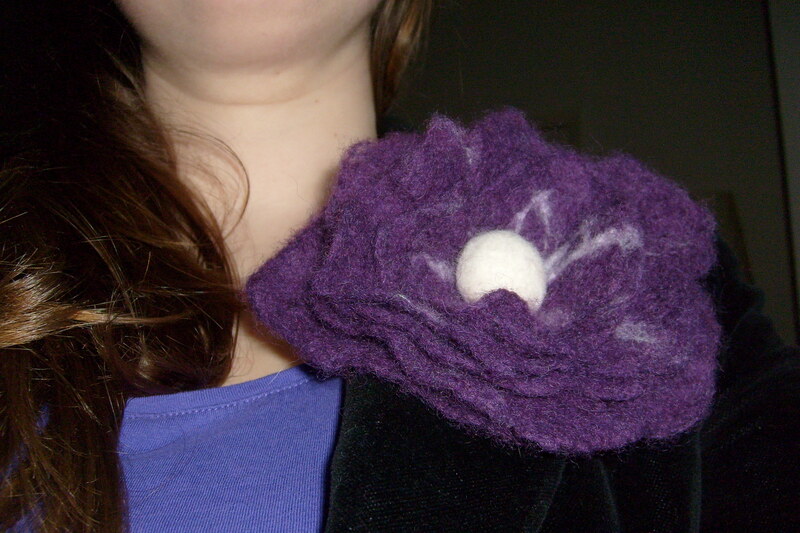 Then I needle felted the layers together. 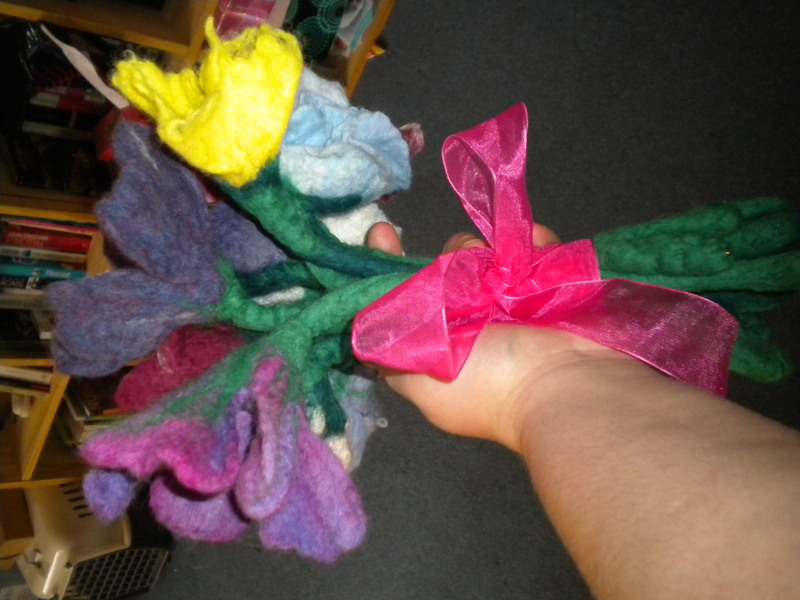 I worked at this for quite a long time to ensure it was strong and to give the petals a bit more shape. 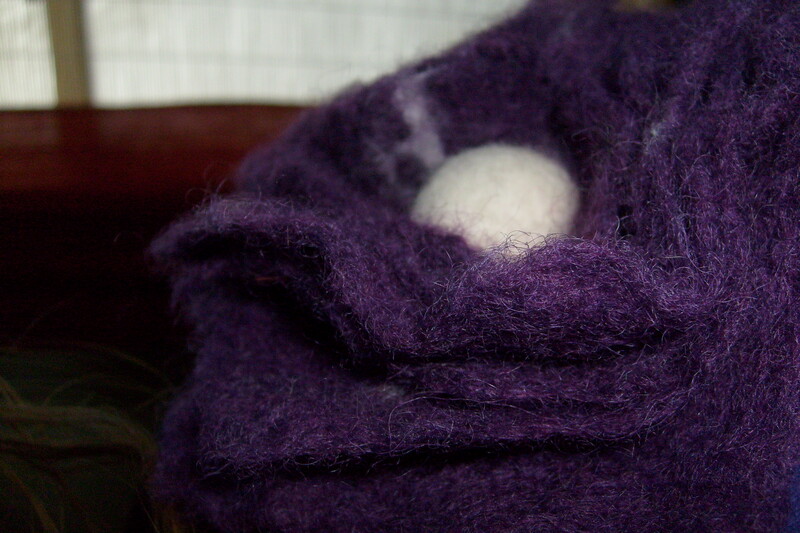 I also needle felted in the ball to the centre. Next came sewing on a pin to the back. I eventually got this right after first sewing the wrong side of the pin down, d’oh! Well, it’s been a while – non felt related things have got in the way of doing this unfortunately! I have had a chance to send off my slipper tutorial for the working with felt site, and I’ve also knitted a cafetiere cosy and have started making a knitted girls bag. More of these to follow later. 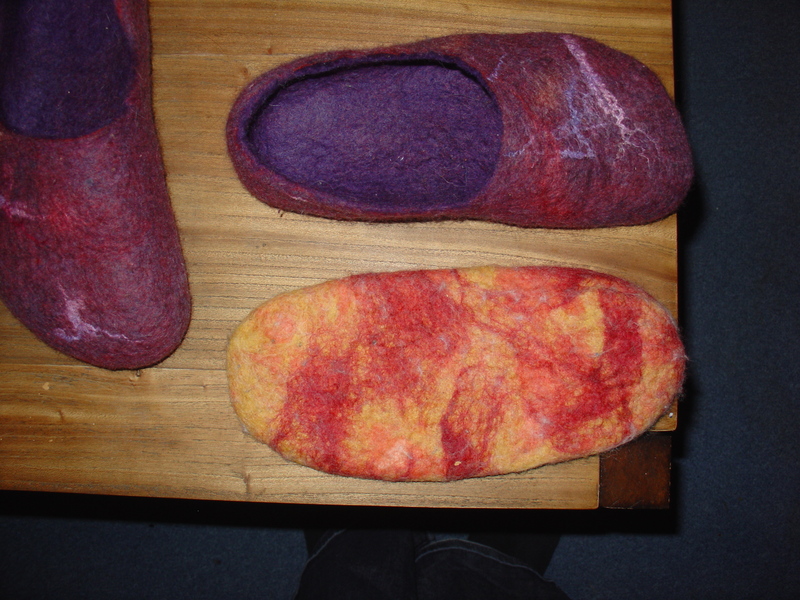 To get to the point though, here is my wet felted slipper tutorial. – Bubble wrap/bamboo blind (it is possible to do this with just the bubble wrap as I do – the blind will speed up the process). – Resist material. I use thick ‘builders’ plastic but I’ve heard is it possible to use bubble wrap. – Leather, Suede, carpet remnants or other non-slip material. Alternatively slipper soles available from specialist suppliers (search Google!). -Your Feet! 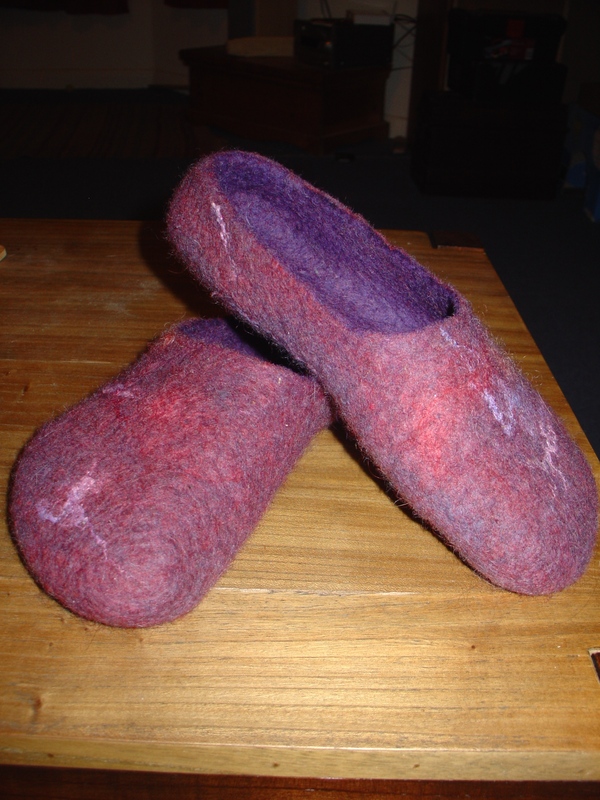 (If you are making these for someone else either borrow their feet, draw a template based on their feet and stop felting when you can fit the size of their foot, cut out onto some cardboard, into each slipper comforably, or buy some polystyrene shoe lasts (again, search Google). – First you will need to make the template. To do this, first trace around your feet onto the paper. Once you have done this, increase the size by 30% – 40%. I did this by eye but you could measure the length and width and do the maths if desired. Now cut this shape out. I always suggest erring on the larger side as it is usually possible to felt more (i.e. shrink more) but not to stretch the felt. – Next you will need to cut the resist material. To do this, attach your paper to your resist material using pins, cellotape or blu-tack (blu-tack is my preferred method). Now cut out the shape. Attach the paper to another piece of your resist material and then cut around it to create a template for your second slipper. – Now lay your towel down on your workspace. Next lay your bamboo blind (if using) and then the bubble wrap, bubble side up, on top of this. 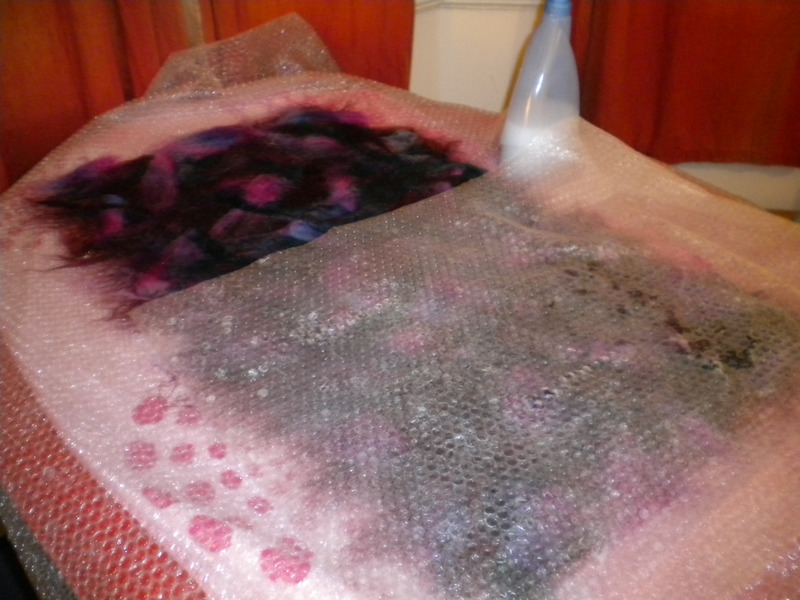 – Next, lay both templates onto the bubble wrap. – Now it is time to start laying down your fibre. Prepare the templates by squirting some warm water onto them – this will help the fibres to ‘stick’ to the template and prevent them moving around too much. Now, start pulling off wispy fibres from your wool tops and start laying them across the templates horizontally. Be careful not to place the templates too close to each other as you don’t want the fibres from each to merge. Add about an inch of fibres all the way around the resists. – Place another layer of fibres vertically over the resists, again adding about an inch around the edges of the resists. – Place your netting over the resists and liberally squirt your soapy water over the top. You want all the fibres to be fully wetted but without pools of water. 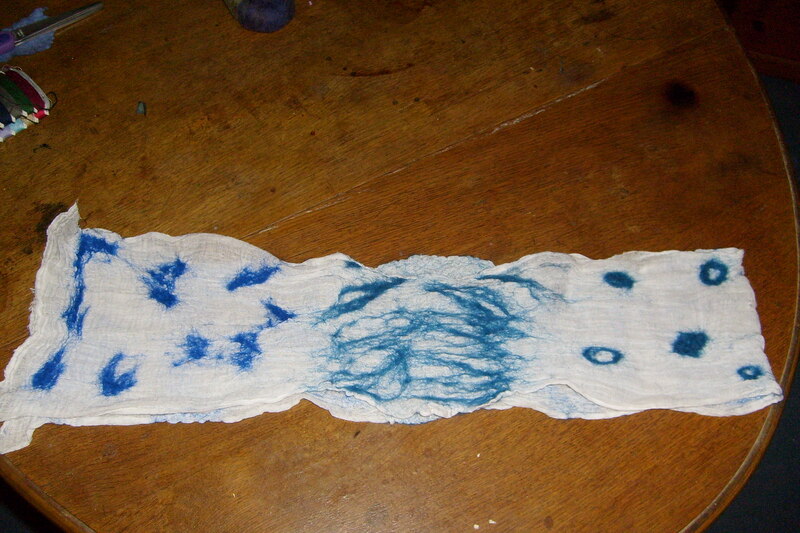 If you have used too much use a J-cloth or another towel to absorb some excess water. 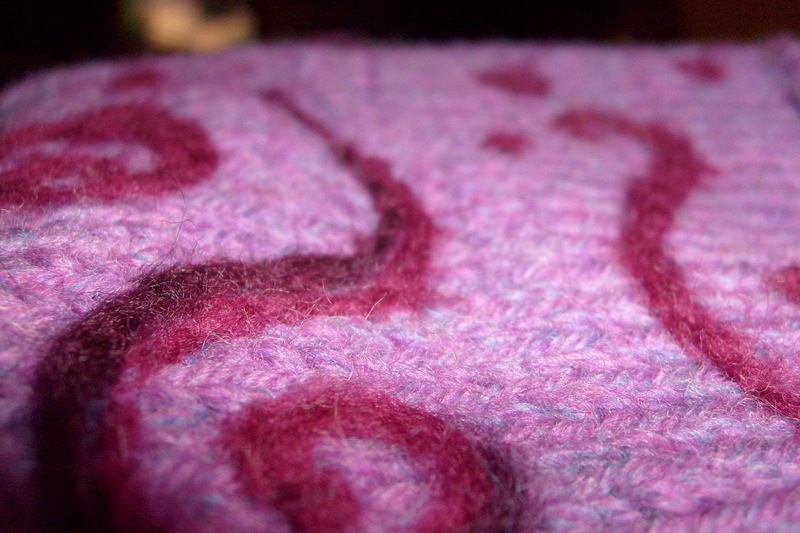 – Start rubbing your bar of soap all over the resist and over the extra fibres around the edges. In my opinion, the more soap the better. – Now use your hands to rub the fibres whilst the netting is still on. Continue doing this until you can pinch the fibres without lifting them away from each other. Keep lifting away the netting to check this and also to ensure that the fibres aren’t felting themselves to the netting. – When you are happy that the fibres are ‘stuck’ together sufficiently, remove the netting and carefully turn both templates over (everything is still very fragile at the moment and being too rough may cause holes to appear!). – Fold the fibres from the sides of the template over. Be careful at this stage ensuring that they follow the shape of the resist but that the resist itself does not pucker at all. – Now lay a horizontal, and then vertical layer of fibres over the template. Include a 1 inch overlap at the edges again. Wet, soap and rub as before. This time ensure that you rub the edges of the slippers too. – Turn the template over and continue this process on each side until you have added enough layers. I used about 8 layers and would suggest no less than this. When laying your last layer there is no need to overlap at the edges. – At this stage you can add any embellishment you wish. 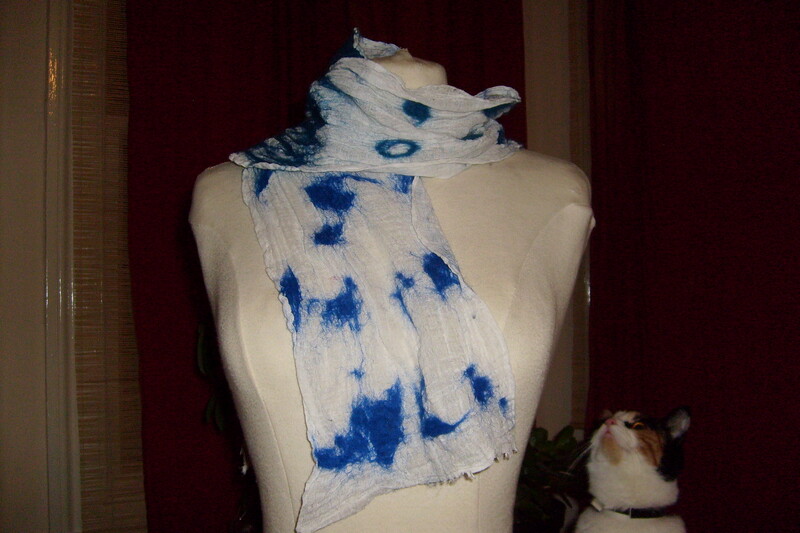 I used some silk tops and some Wensleydale fibres in complimentary colours. Wet, soap and rub these as before until you cannot lift them away from the rest of the slippers. – Now you can start rolling both templates. Roll them up in the bubble wrap and blind (if using). 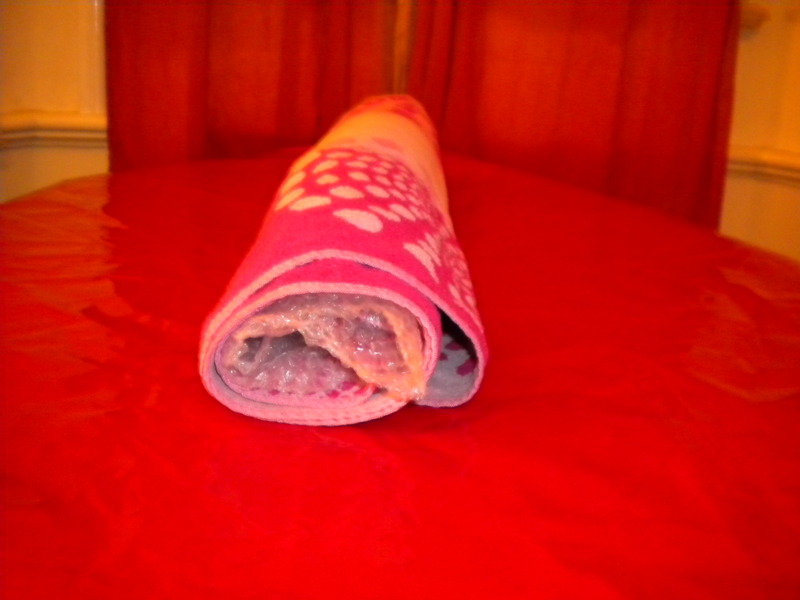 I like to wrap the towel around this roll as it prevents it from slipping or unrolling. You could tie the bundle about a third in from each end instead if desired. – Roll (don’t be shy with the pressure used!) 50 times. 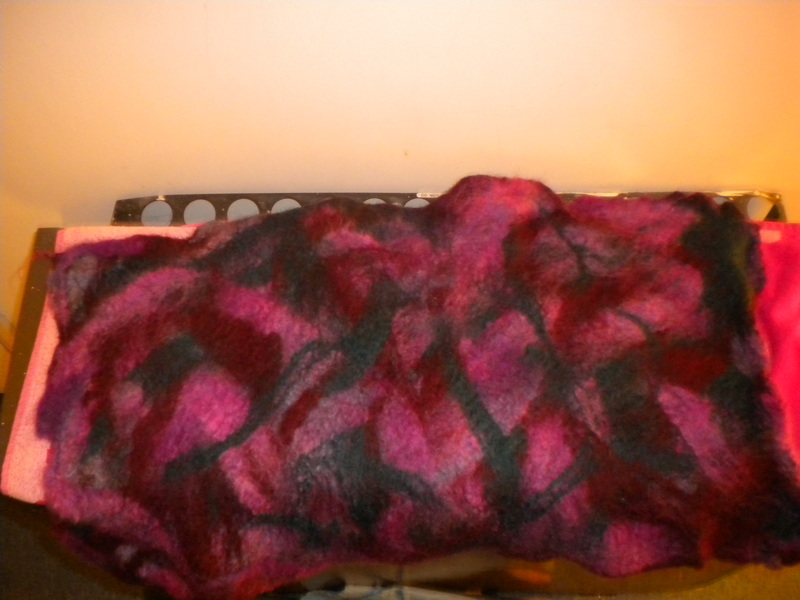 (If you are new to resist felting I would suggest checking the shrinkage more regularly than directed here.) Unroll the bundle, move the templates 90 degrees, and roll the bundle back up. Roll again 50 times. – Continue rolling in each direction until your templates are about 5% bigger than your feet. They should feel reasonably well felted at this point. – At this point, the resist should be buckling quite substantially inside the felt. Cut open the felt – Choose which side you want to be the top of the slippers (the side you put your feet into) and then make a SMALL cut about a third in, cutting vertically. It is tempting to cut towards the heel end of the felt however you need to allow for some of the material to cover your heel. Slowly increase the size of your cut until it is big enough to place your feet in. You may need to widen the cut but the final shape can be finalised later. Do this to both slippers. – Now rinse the slippers in some hot water to remove some of the soap. – Place the slippers onto your feet and continue felting by rubbing all over with bunched up bubble wrap, adding more hot soapy water/rubbing more soap on if necessary. Continue rubbing until the slippers fit your feet perfectly and don’t feel loose – this probably won’t take very long. Adjust the slits to neaten or make them comfortable to wear if necessary. Ensure that you rub the slits themselves with soapy water and bubble wrap and ensure the inside of the slippers are fully felted. At this stage the slippers should be relatively firm and keep their shape. – When the slippers fit perfectly, rinse in the hottest water you can stand, gently squeeze out water and then rinse in cold water, squeezing out excess water again. Repeat the rinsing process 2-3 times to ensure all the soap is removed. 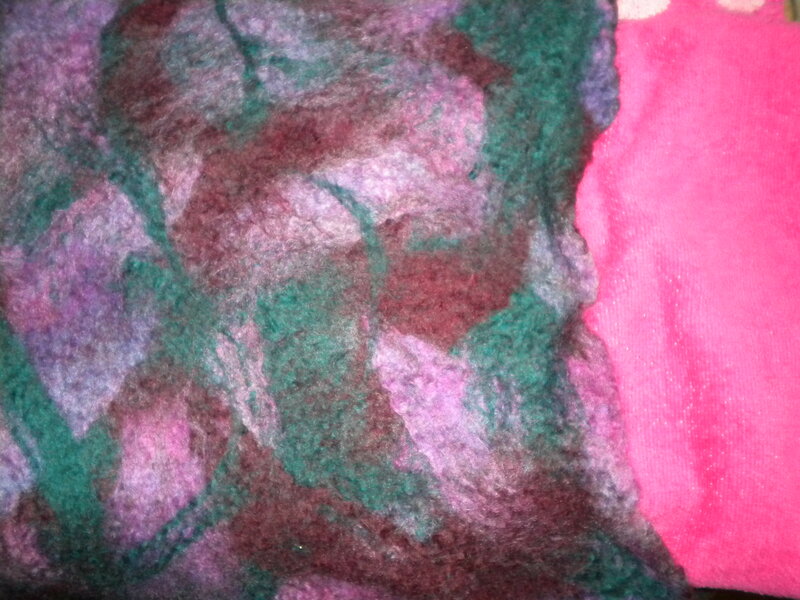 This will also ‘finalise’ the felting process. – Put the slippers back onto your feet to reshape, and then carefully remove your feet. You can now insert bunched up plastic bags into the slippers so they keep their shape whilst drying. Alternatively put them in a safe place away from idle hands! Place in a nice warm spot. I left mine in front of the radiator. – When the slippers have dried fully you can add the non-slip soles (essential when you will be walking on wooden/lino flooring and also to prevent the sole from wearing out). You can cut your non-slip fabric slightly smaller than the sole of your slippers or just add 2 circles on each slipper – one larger to be placed near the toes and one smaller for the heel area. Sew your non-slip fabric onto the base of your slippers. 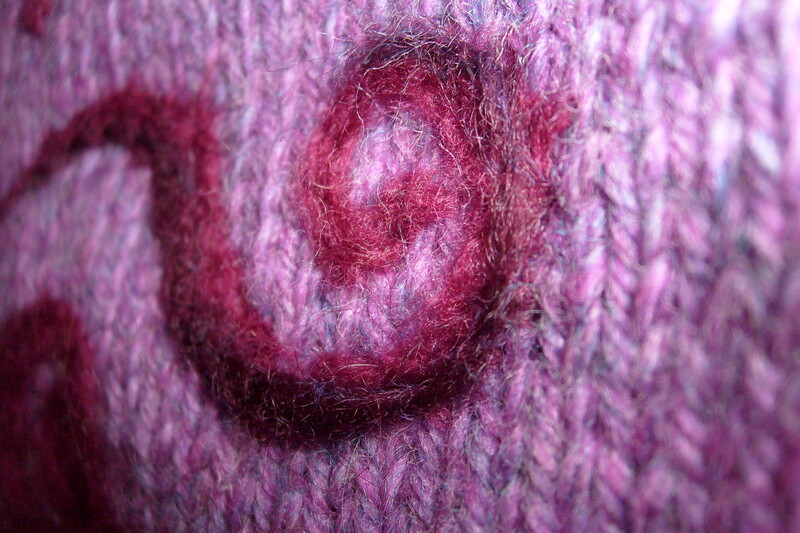 – You can also use blanket stitch around the opening of the slippers if desired using yarn or embroidery thread. 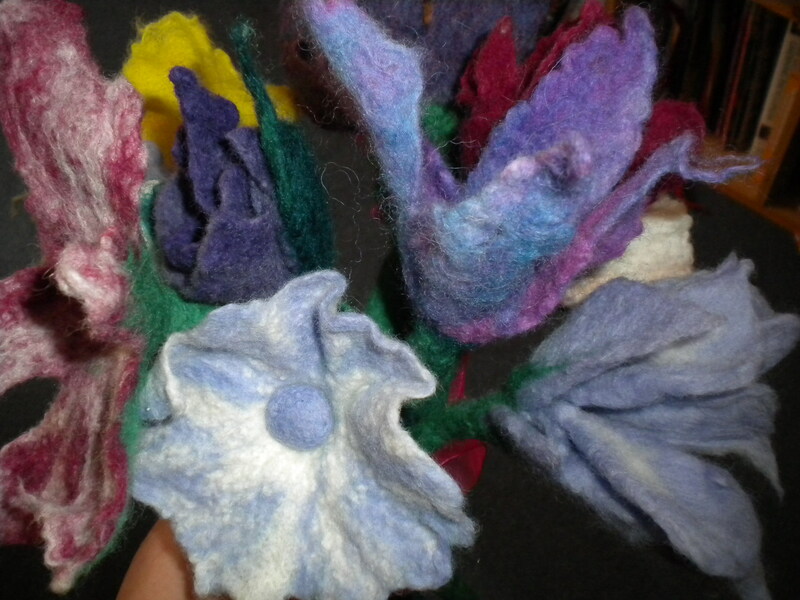 You can needle felt any decoration onto the slipper or sew beads or sequins on if you wish. – Put your lovely new slippers on and enjoy the warm snuggliness! Note: If you want boot shaped slippers, you will need a large piece of paper on which to draw your template. Draw around both feet + 30% leaving a wide gap between both feet. Draw a line to connect both heels and another line about half way towards the toes to connect both feet. You want these connecting lines to be at least 60% longer AND at least 30% wider than you want the boots to be. I found that the ankles shrunk much more width ways. As you will be making the slippers in 1 piece and then cutting apart you can shorten the booties if necessary but you can’t increase the size! Now attach the paper to your resist material and cut out the shape IN ONE PIECE. 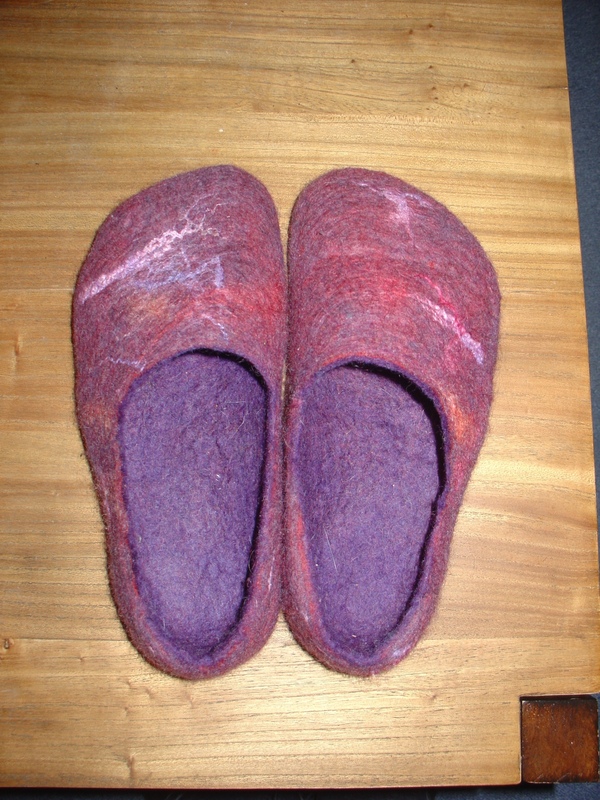 If you’re looking for the tutorial for these slippers (or these: https://fortheloveoffelt.wordpress.com/2010/02/14/more-wet-felted-slippers/) you can find it here: Slipper tutorial. 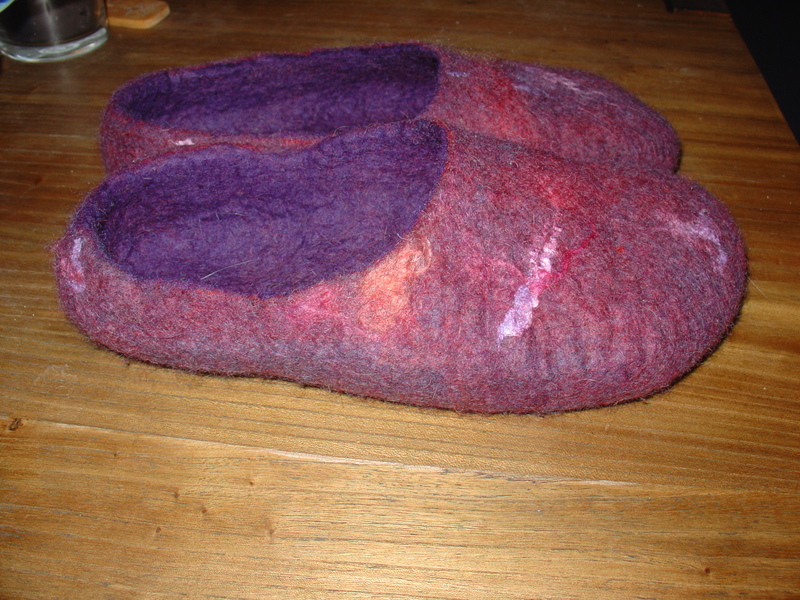 A while ago I posted that I’d made some wet felted slippers, well now I’ve taken the photos for you to see. 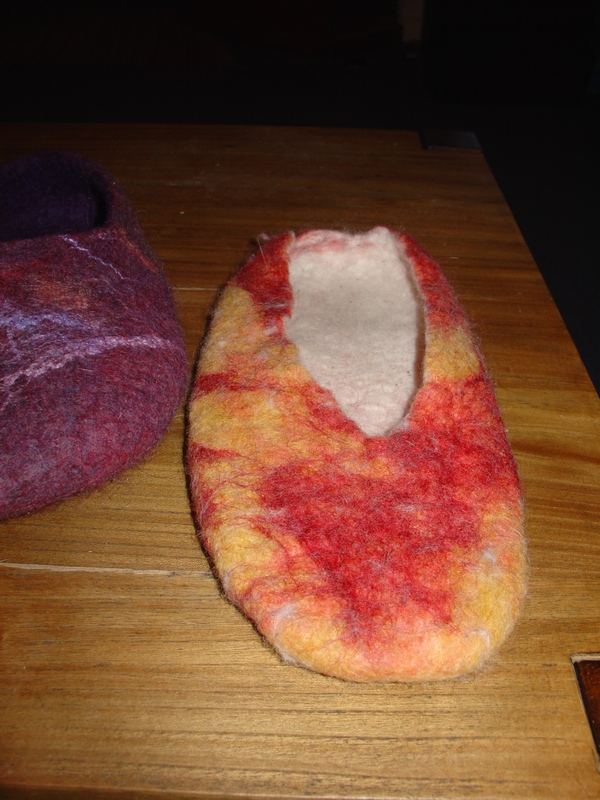 I have also been asked by Sara of the Working with Felt community to provide a slipper tutorial for the next felting challenge on the site, and to judge the entries, which is something that I’m very excited about! 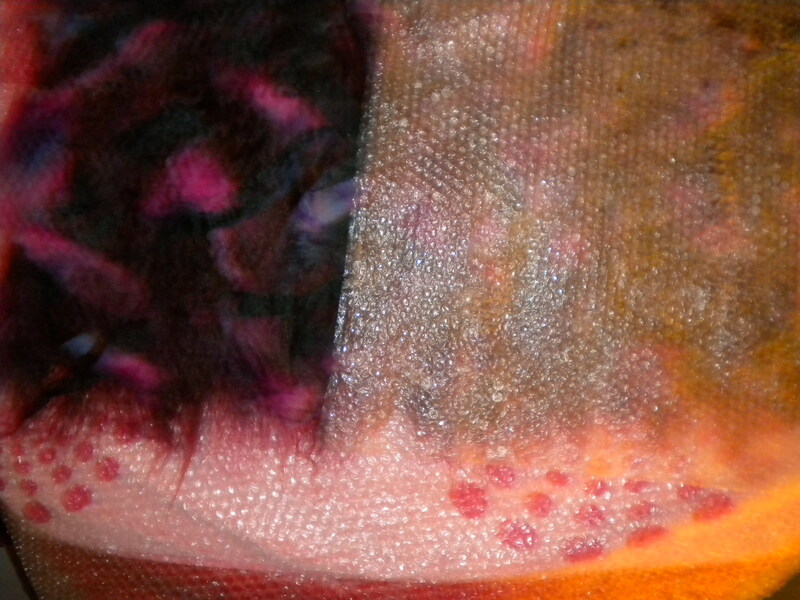 As you can see, I have added some extra fibres on the final layer to embellish. As said in the original post (which you can click on above), I used Wensleydale and silk tops for this and the ‘inner’ is merino whereas the ‘outers’ are finn. 1. The template I made, though following a tutorial, was far too small. This meant that I couldn’t felt the slippers well enough as they would have become too small for me in the process. 2. I didn’t use enough felt. I think they only had 4 layers whereas the second pair have 8 (and they are thicker). 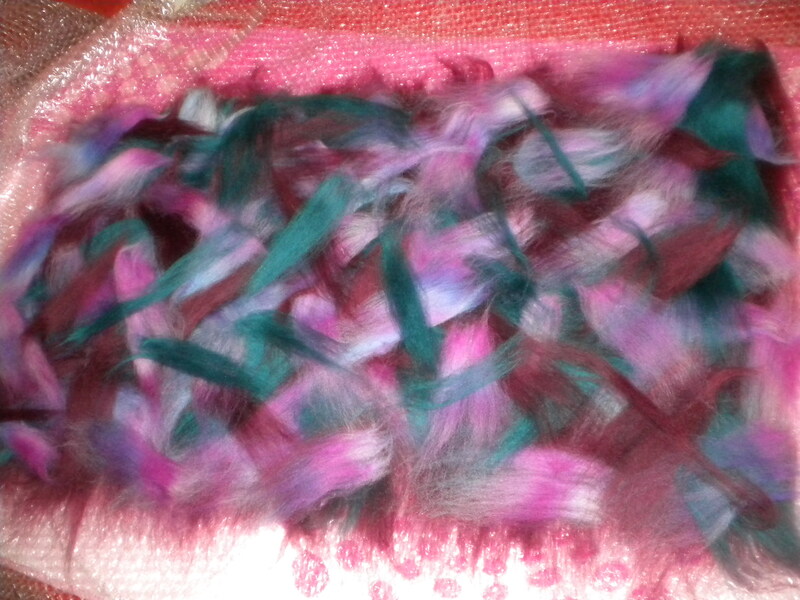 I also used purely merino…as a result they started pilling hugely. Next time I make slippers (probably for my Mum, although my boyfriend keeps asking for some too!) I will make boot style ones. This will be easy to do as you basically just extend a line between the feet parts of the template and felt them as one piece. Once the tutorial is no longer in its draft format and is on the felting community I will also upload it here, so keep your eyes peeled.